United Nations HQ-NYC, NY—After horrifying gas attacks in World War I, the world responded in a massive way. It was a call to action. A 1925 treaty barred the use of chemical weapons, and then the 1997 Chemical Weapons Convention set a 2012 deadline to fully eradicate them. Chemicals known to be a threat to human life were put on a blacklist, never to be used, even as weapons in war. These chemicals fell into the category of disrupting and endangering the lives and livelihoods of peoples all around the world. Now, unchecked emissions from fossil fuels are accumulating in Earth’s atmosphere, trapping thermal energy at an alarming rate, and posing a real and present danger to human lives and livelihoods. They are, in this sense, chemicals that wage war on populations, by disrupting atmospheric normalcy and basic life-support systems, and by contributing to large-scale food and water shortages. We are living in a state of direct conflict between a fundamental behavior of our civilization and our viability as a species and as a world community. The next era of chemical threat is already here, and we would be missing an important opportunity to prevent major damage and loss, if we don’t take the destructive power of a Greenhouse Gas Attack seriously. Whether political will allows for timely and comprehensive action or not, many nations do not have a choice but to face that attack head on. CO2, Methane, Polycyclic Aromatic Hydrocarbons (PAHs), CFCs—these are chemicals the unregulated use of which has dangerous implications for the social and economic stability of the planet. And we are all (some more than others) at fault for contributing to their escalating use. They are, to quote the UN Framework Convention on Climate Change (UNFCCC), a form of “dangerous anthropogenic interference with the climate system”. These heat-trapping chemicals—whose accumulation in our atmosphere is pushing global temperatures higher—may not be like the Sarin Gas attacks used systematically and repeatedly in Syria from 2010-2014, but they are a direct threat to the lives and livelihoods of many millions around the world. The United Nations has sanctions against the use of toxic chemicals against human beings in any situation, even in open war. We almost have to wonder if the Organization for the Prohibition of Chemical Weapons—which monitors international agreements on the use of toxic chemicals—should add some more chemicals to their list. GHGs disproportionately target the ability of the Global South to defend their borders against these stateless chemical attacks. Consider the experience of Andean villagers in Peru, the climate-change-driven conflict in Syria, the super typhoon in the Philippines… When we speak of atrocities against humanity, we usually think of militarized weapons—nuclear, biological, or chemical—that are delivered in an acute point in time and break or violate a human right. But like the chemicals used against civilians in Syria, and the shortages of water and food in Peru, GHGs have the effect of stateless weapons creating harm that no human being or community can avoid, on their own. There is no clear commander in chief and no global consensus on who should take responsibility for dangers these chemicals pose to civilians. We are not treating the deliberate deployment of these chemicals as a crime, and so it remains difficult for many to imagine how our response to climate change could include sanctions. The violence and unrest in Syria, Egypt and Yemen is not limited to the regional impacts of climate change, through water scarcity and food insecurity. Many are quick to blame it on complex interconnections between corruption, energy scarcity, neoliberal capitalism, unchecked inequality, and violent and widespread political repression. But if climate change is at the root of armed conflicts and instability of this severity, the United Nations Security Council (UNSC) will need to start responding more seriously to the threat. Accordingly, in 2007, the UNSC held its first ever debate on the impacts of climate change for international Peace and Security. Over 50 member-states spoke for and against the ability of the United Nations to judge climate change as a threat to be regulated by the council. If a chemical falling under the 1997 Chemical Weapons Convention were used, the United Nations system would respond without delay. Policy options for imposing sanctions abound, and a sustained campaign of international shaming would ensure a watch-dog presence until those who used the black-listed chemical were forced to face justice. Yet, the treatment of excess emission of CO2, methane or other GHGs as a threat to human life and national sovereignty remains out of reach. This new geography of violence and degradation is nothing new. Western military planners recognize the dangers in the convergence of political disorder and climate change. The Pentagon released a study in 2012 describing climate change as a “threat multiplier” which would greatly reduce the ability of states to provide food and water for their peoples—a deficiency would could develop into further unrest. Climate change is already causing large-scale migrations of people away from areas affected by drought or heavy weather and causing great stresses on city centers unable to support climate refugees. This scenario gives rise to more terrorist threats, as governments are unable to provide basic services to their populations. In this new era, characterized by a less stable climate, geographic political violence is the norm. Marcus King, an expert on climate change at George Washington University, has recognized climate change as playing a part in the rise of the Islamic State. “Climate change and water shortages may have triggered the drought that caused farmers to relocate to Syrian cities and triggered situations where youth were more susceptible to joining extremist groups,” King told The New York Times. By seizing scarce water resources, the Islamic State was able to expand its power. If climate change encourages the rise of terrorist, or opportunistic regimes which pose a threat to international peace and security, then shouldn’t the United Nations Security Council (UNSC) address climate security risks as an underlying condition contributing to the rise of militarized states and paramilitary insurgency, and not only react to the symptoms of the underlying condition? The Security Council identifies threats to international peace and security. It takes the lead in determining the existence of a threat to the peace or an act of aggression. The aim is to assist in bending the arc of history towards justice. It calls upon the parties to a dispute to settle it by peaceful means and recommends methods of adjustment or terms of settlement. Under Chapter VII of the UN Charter, the Security Council can take enforcement measures to maintain or restore international peace and security. Such measures range from economic sanctions to international military action. So if one has a burning question about the potential role of sanctions relating to climate change impacts, where should one go to ask? Josh Black is the chief of the Sanctions and Counterterrorism Unit at the United States Mission to the United Nations. He supervises a team responsible for advocating U.S. interests with respect to UN sanctions regarding al-Qaeda, Afghanistan, Cote d’Ivoire, Guinea-Bissau, Central African Republic, Libya, North Korea, the Democratic Republic of the Congo, Iran, Iraq, Liberia, Somalia and Sudan. He advises the U.S. Permanent Representative to the UN on strategic issues related to sanctions policy and advancing U.S. goals related to counterterrorism. He serves on numerous Sanctions Committees of the UN Security Council that are mandated to improve implementation of these sanctions regimes and track compliance. 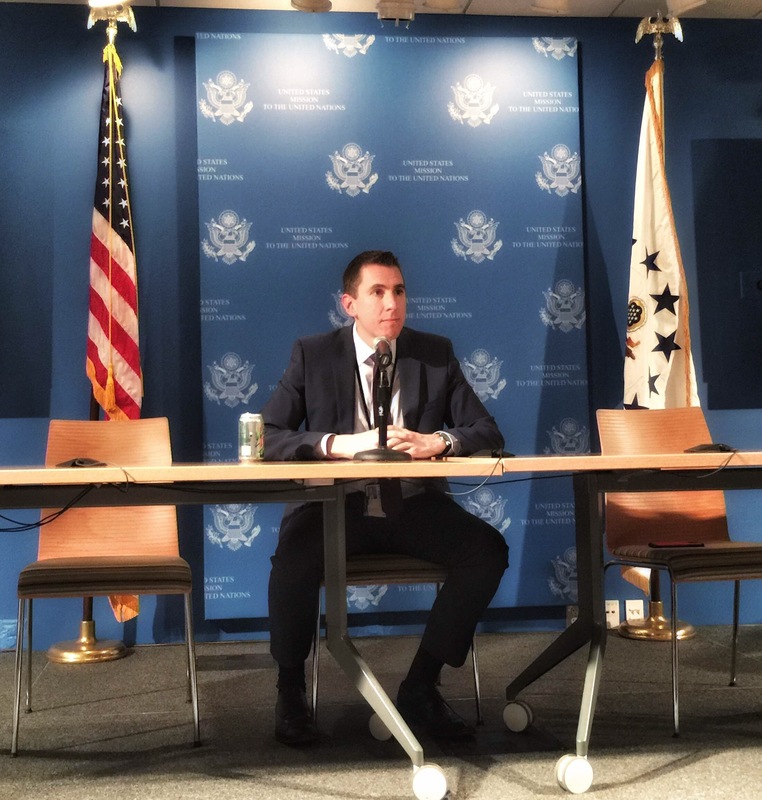 On May 6th, 2015, The United States Permanent Mission to the United Nations hosted a private talkback “The Discussion for American approaches to the United Nations” with Joshua Black, the Chief of Sanctions on Counter-Terrorism Unit and a member of the US team on Nuclear Negotiations. Black’s demeanor is that of an experienced negotiator and one that knows how to break down high-level information into something relatable. Fair enough, the four items that made the list are all standard threats to human rights and represent the darkest side of humanity, but when asked about the role of climate change as a major threat to Peace and Security, Black cited a need to more clearly define climate security threats as security threats, and shifted to calling for action. “There are no international agreements or rules that exist on how to defend or define this,” he said referring to climate change conflicts. “Before you get to the point of punishing rule-breakers, there needs to be a defined set of rules countries need to follow.” He further commented that it is within our moral imperative to act now and address climate change, citing Obama’s much talked about “anger translator” at the recent White House Correspondent’s dinner. While acknowledging the gravity of the threat, and the moral imperative to respond, the answer came up short on the role that sanctions could, would or should play in future responses to climate-driven conflicts. If there is no risk of incurring sanctions, then what type of political responsibility can the United Nations hope to inspire among its member states? The question is appropriate given the daunting task facing the Secretariat responsible for implementing the United Nations Framework Convention on Climate Change (UNFCCC). The Durban Platform, through which the terms of the Paris agreement are being written, calls for each country to publish a vaguely titled “INDC”—UN-speak for an “Intended Nationally Determined Contribution”—which will lay out the country’s plans for addressing climate change through short and long-term goals to 2025 and beyond. The INDCs are the foundation for an internationally “agreed outcome with legal force”, to decarbonize the world economy. That agreement is the principal desired outcome for the COP21 climate talks in Paris at the end of this year. These climate change plans represent what countries are willing to do, under rule of law, to mitigate and adapt to climate risk, while building a low-carbon future economy. The process will, in effect, blacklist excess GHG use, with the aim of avoiding dangerous climate disruption. There is, however, a human rights element missing from the conversation. Few dangers facing the world at this time are as grave as those posed by climate disruption. There should be discussion on considering excess GHGs as a type of illegal chemical agents, with consequences for those who abuse human rights through the unmitigated burning of fossil fuels. This is the year of the INDCs and the Post-2015 Sustainable Development Agenda, and it may be our best opportunity to define climate change as a real-time security risk. And as more and more member states submit their climate contributions, the international conversation should begin to focus on how to respond to those whose actions are obstructing or reversing action needed to mitigate the threat of dangerous climate disruption—when to levy economic and trade sanctions against them. President Barack Obama described climate change as a “creeping national security crisis” that will require the armed forces to “respond to refugee flows, natural disasters, and conflicts over water and food”. To be sure, the link between climate change and the risk of violence is supported by many independent studies. Yet, there was one question Black felt unanswerable at the Permanent Mission of the United State’s Security Briefing on Counter-Terrorism and with good reason. If there are sanctions levied against those who commit mass atrocities and human rights abuses, and inaction on climate disruption brings suffering and conflict on a global scale, then shouldn’t climate-driven conflict be considered a unique threat to international peace and security? Whether it is or not may decide how strong and deliberate our global response will be.